What To Do When Your Website Is Not Generating New Coaching Clients? You create your own website for your coaching business & showcase a course, a particular product or a service that you want to provide to your coaching clients. But the website doesn’t seem to work. There is no traffic on the site. You are not getting any email subscribers. And you don’t seem to be able to reach out to the people who need your service. You begin to worry, doubt yourself, and think you are falling into an endless pit of failure. Stop right there! Worrying is waste of time. Today I am going to show you the essential elements required to create a conversion optimised landing page for your coaching business. 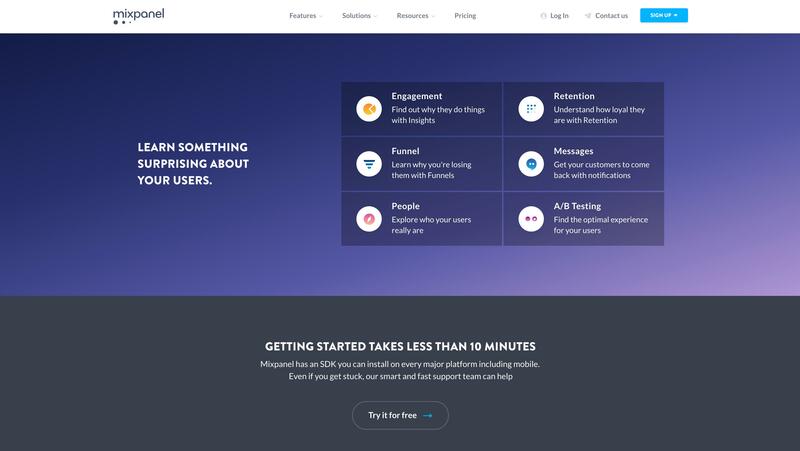 “A page that your users first land on (duh) which has a call to action on it. Usually, it calls the visitor to click a button to go to another page of your website, or subscribe to a mailing list or for a discount or freebie. Typically, on a landing page, the magic all happens above the fold. Just like a folded newspaper, the top section of the paper should tell you exactly what the paper will be about. WHY MIGHT YOU USE A LANDING PAGE? You are giving away a freebie to attract people to sign up for your email list. You are using it to collect emails before you launch your coaching website or blog. You just have a specific call to action you want somebody to take – like signing up for a webinar or registering for an online course. Let’s say One landing page is selling all-terrain tents to hikers & campers. Another landing page is inviting in-house marketers to a weekend convention in Glasgow. A third landing page is asking binge sitcom watchers to take an online quiz. “The page that works for any of these three is unlikely to work for either of the other two. That’s because there’s an incredible amount of variation among their audience, purpose, intent, product, angle, focus, industry, niche, perception, buy-in, cost, messaging, value proposition, and testimonial approach. Your Key Messages Will Truly Resonate, If They Echo Your Customers’ Needs. Any customer or client spends their money primarily on two things. First, they readily spend money to combat pain. Second, they spend money to pursue pleasure. Jon Burgstone and Bill Murphy, Jr. from FastCompany list pain and pleasure in that order for a reason. All things being equal, the more acute the pain or problem, the more likely it is that you’ll be able to offer a compelling solution. The more compelling the solution, the more quickly the customer will pay. By referring to pain rather than needs or preferences reinforces the point: Customers are people. They appreciate the world through the prism of their experiences. They sense what challenges or bothers them–their pain–but they often can’t even conceive of the solutions–their needs. How would you know what their needs, problems and pain points are? Ilise Benun, in her blog post – How to Find Your Ideal Client’s Pain Points, wants coaches and consultants to focus on asking themselves this question every time they seek to understand their client’s wants, needs and major sources of pain. These online & offline places are a thriving hub of potential coaching clients who are discussing and airing their grievances daily. All you have to do is go to these places, patiently go through the problems, and figure out which ones to prioritise based on your coaching niche. Where can you begin, you ask? Check out popular magazines in your line of business. One recommended strategy is to go through Amazon reviews of books that relate to your coaching niche. They are great sources of discussion and you will find problems & solutions people are seeking out online. There are a multitude of niche blogs available that are already catering to readers & their pain points – GrowthHackers, StoryBrand, HubSpot, NeilPatel’s Blog are a few to name. Social media (Twitter, LinkedIn, Instagram) are good sources too, but these niche blogs serve as secondary discussion forums (Reddit being primary) that have their own dedicated reader base. Tap these sources relentlessly. Facebook groups are also great places for you to have conversations with potential coaching clients and help solve issues that people discuss thoroughly on a day-to-day basis. But hands down, the best way to understand your audience is to interact with them directly. Face to face or via online video calls, either way, you get to know their exact emotions & feel their pain points in a better way. The first rule of Copywriting talks about researching your target audience. Through direct interactions, you get the exact words & phrases that your audience is using to talk about their pain points. Using the audience’s language you are then able to create awesome copy for your coaching website. The more you delve deeper into researching and understanding your potential client’s pain points, the more your landing page will attract traffic and result in successful conversions/lead generations every month. Once you have a dedicated list of pain points, you’d then have to set up the messaging/copywriting on your coaching website and simultaneous email campaigns to talk about these problems & their solutions. And that you know how to deal with it. Jon and Bill, in their blog post – Why Customer Pain Is Your Most Important Resource, highlights the simplest method available for coaches to figure out whether a new venture idea will actually address a real-world customer pain or not. “Can you describe the pain your company solves–and why anyone should care–in just a few words? Can you then persuade a prospective customer to purchase your product or service using your simple explanation? Is it fatal if you can’t articulate a compelling customer pain? It can be eventually, but it also means simply that you haven’t fully formed your new venture idea yet. Many great entrepreneurs go through numerous iterations before they figure out the best uses for their innovations. It can take time to find the pain. What does your customer find too costly? E.g. does it take them a lot of time, cost them too much money, or require substantial efforts? How are current solutions underperforming for your customer? E.g. which features are they missing, are there performance issues that annoy them, or malfunctions they mention? What are the main difficulties and challenges your coaching clients encounter? E.g. do they understand how things work, do they have difficulties getting certain things done, or do they resist certain jobs for specific reasons? 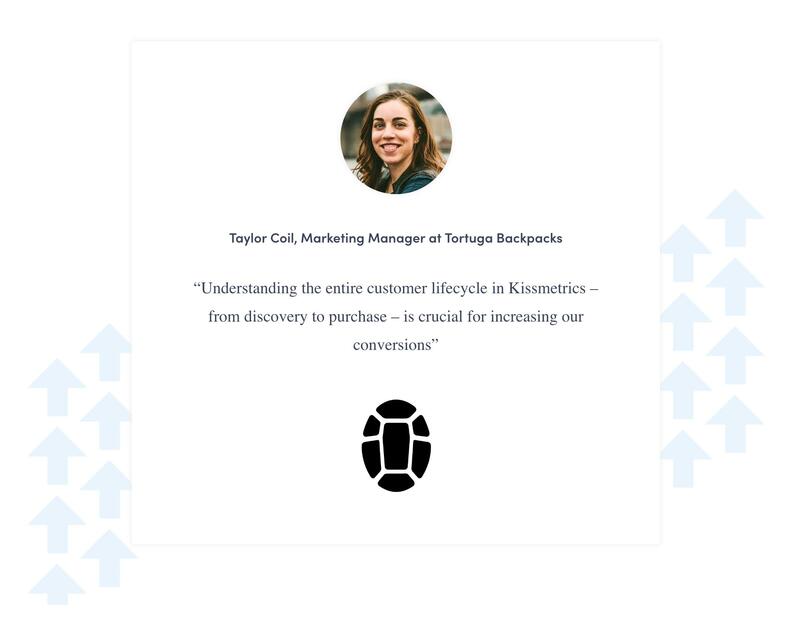 What’s keeping your customer awake at night? E.g. What are their big issues, concerns, and worries? What are barriers keeping your coaching clients from adopting a solution? E.g. Are there upfront investment costs, a steep learning curve, or are there other obstacles preventing adoption? How to Align your Brand with your Customer’s Pain Points? You’ve begun to understand your target audience, their needs & desires. Now you translate that understanding into your coaching website design & messaging (branding & copywriting). This becomes your perfect communication medium to attract coaching clients & generate leads for your business. Elizabeth McCravy, in her insightful post – How To Speak To Your Customer’s Pain Points In Your Marketing, wants you to focus on exploring more about your brand alongside the pain-points research you are doing. Ask yourself: What is the solution you are offering through your coaching website? Read over your past testimonials and look for patterns of problems solved. When you’re speaking to a potential client, what do you they say? What are they looking for? Survey your audience on social media or your mailing list and ask about their problems in relation to your products/services. Ask yourself: How can your products/services make someone’s life better? Is there a bigger issue that your brand is defeating? What will your ideal client’s life look like if they DON’T get what they want? What happens if they never discover your offering? And here are a few awesome yet simple ways you can show that authority in your coaching niche. Testimonials – Let others do the talking for you with proof that you can solve the problem your potential customer is seeking help with! Awards and/or certifications – Are you certified in what you do? Are you “award-winning?” Let’s show it! Statistics – It’s often overlooked, but quite powerful in making a strong first impression on your coaching website visitors. Customer success, Business ROI, Years of Experiences, No. of Clients served etc. are a few vital statistics that you should mention on your landing page. Do you believe that your offering can really help people? Do you believe that you have the solution to people’s problems, if only they can find you? With pain points & customer research done and dusted. Let us now talk about the essential elements required to create a conversion optimised landing page in 2018. One of the easiest elements to change on a page is the headline. It’s also one of the most important parts of the page to optimise if you’re trying to get a lift in your conversion rate. However, when tasked with writing an engaging headline for a marketing piece, many marketers get it wrong. In an interview, Dr. Flint McGlaughlin, Managing Director, MECLABS, speaks about this problem. Principle #1: All marketing messages must be centered primarily around the interests of the customer. Therefore, when it comes to crafting headlines, emphasise what the visitor gets rather than what they must do. Benefits – Any great headline will tell the visitor – right away – what problem(s) this page can solve. The headline should be short. Never make it more than 20 words, and preferably limit it to 10. #you – When we read the word “you,” our brains respond in a similar way as they do when we hear our own names. They appeal directly to our sense of identity, making them a powerful way to connect with your prospects. This approach also reinforces prospects’ desire to be treated as an individual, rather than just another customer. #easy – If you can solve a prospect’s problem and make it as easy as possible for them to do so, you’re onto a winning formula. People want to solve their problems, but they also want to do as little as possible to accomplish their goals. #save – When it comes to committing to a purchase, most prospects are looking to minimize two things: how much it will cost them, and how long it will take. Even if time and money aren’t your prospects’ primary concerns, the word “save” has powerful implications that can make your landing page copy much more persuasive. #results – The best salespeople know to let the product do the talking for them. So whatever you’re trying to sell, include real examples of how your product or service has helped existing coaching clients. This not only serves as a trust signal, but it also proves that your product does what it says it does. #guarantee – Your prospects are even warier of the possibility of losing something, whether it be time, money, or something else. 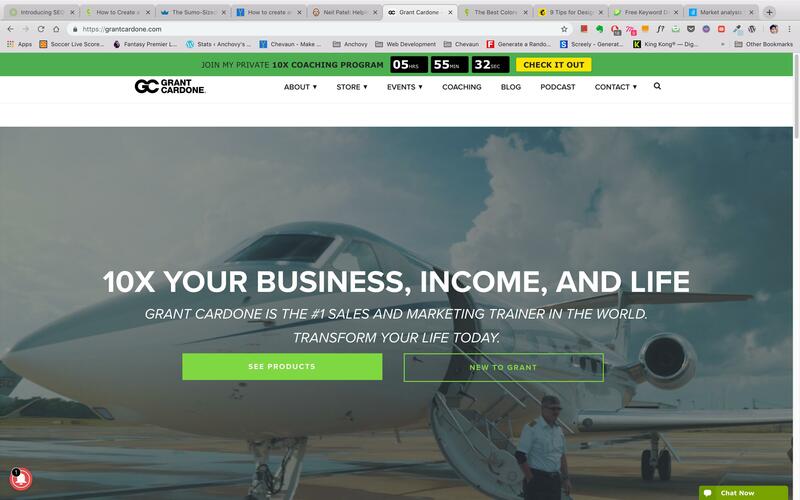 That’s what makes the word “guarantee” so powerful – when used correctly, it effectively removes the risk of at least trying whatever you’re selling. 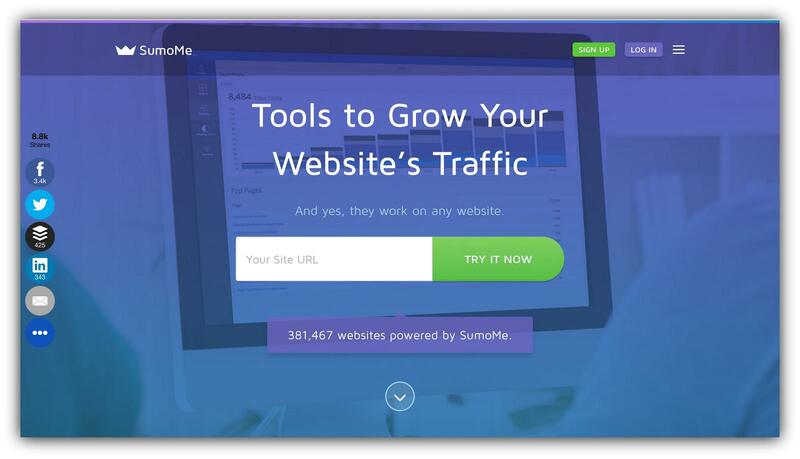 Sumo has these amazing Headline Formulas you can use to insanely boost your landing page conversions. 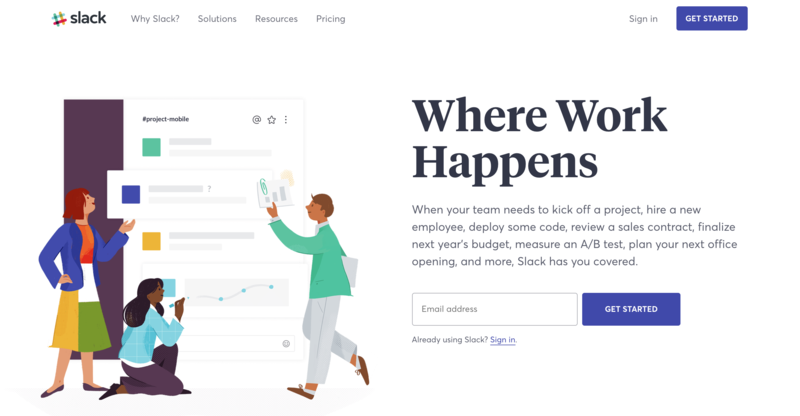 MailChimp – It’s still a few months from 2019, but they are clear about what they are providing for their target customers. And the fact that they’ve managed to club New Year Resolutions with Business Goals is quite clever. StoryBrand – A clear message in the headline for specifically targeted audiences, and a clean website design all around. And when it comes to headlines, Donald Miller knows all the subtleties & the sweet techniques that help him convert website visitors into coaching clients. A masterful copywriter indeed. “Not all landing pages have a subhead, but a good subhead can be incredibly compelling and draw people in almost more than the headline. And we mentioned earlier there are no specific rules for landing page elements and their positioning. Yes, a persuasive subheading is usually positioned directly below the main headline. The subhead can go into more depth & detail than the headline if your branding so requires. Their headline, “Welcome to Medium, where words matter.”, is precise & attention-grabbing. Their subhead allows the reader to learn more about their platform. And it is clear that the user can access Medium from anywhere on the go, which is an added benefit to using their services. So the headline & the subhead together makes the visitor more likely to click the “Get Started” button than they would after reading the headline alone. 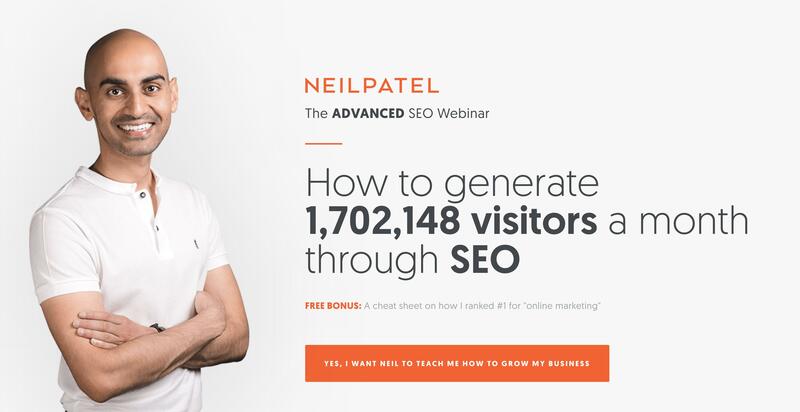 Neil Patel gives us another lovely example that the explanation doesn’t always have to come after the page’s most compelling statement. HelpDesk, for example, flips their headline and subheadline on the following landing page. Although “A help desk for teams that insist on” is placed above that main headline, it’s clearly the subheadline. It’s much smaller and not featured as prominently. Still, it elaborates on the headline’s general idea by explaining who the platform is for. The position switch seems to be intentional. Taken together, it forms a complete idea of what HelpDesk offers. As a coach, in any field or business, you will be dealing with people. And, for people to hire you as their coach, they need to trust you first. You can provide them with great content via your newsletter and blog. But, that takes time. You can tell them how long you have been working in a particular industry. This will tap into the authority bias and people will trust you. But, it’s not personalised to their current situation. The best way to build trust in a service business or for that matter in any kind of business is by showing them the results of your previous customers/clients via testimonials and case studies. A trustworthy testimonial goes a long way in cultivating their trust. That’s all very common and maybe you already have some testimonials on your coaching website. Right? But, what makes a great testimonial? 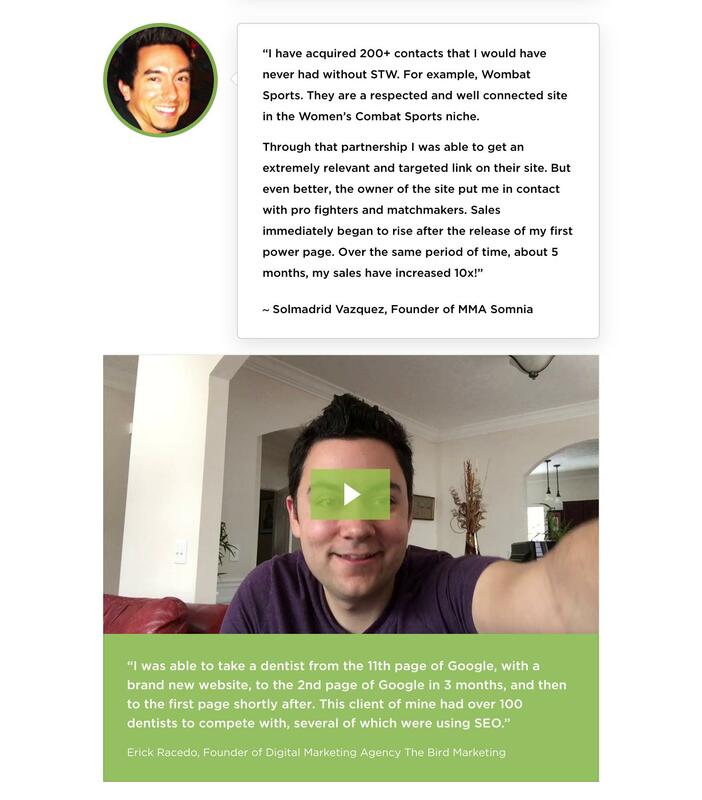 Which testimonials encourage your website visitors to take action? Which testimonials increase your sales? Which testimonials will help you build lifelong trust? We went through plenty of websites for coaches, and they rarely hit the brief when it comes to client testimonials. As mentioned above, they either don’t display any testimonials (which doesn’t boost your trust & authority one bit) or if they do have any, these testimonials are not convincing enough. Bad design, poor layout, lack of authentic pictures, or irrelevant context degrade the quality of testimonials you put up on your coaching website. You can take a look at a few examples of Client Testimonials here. 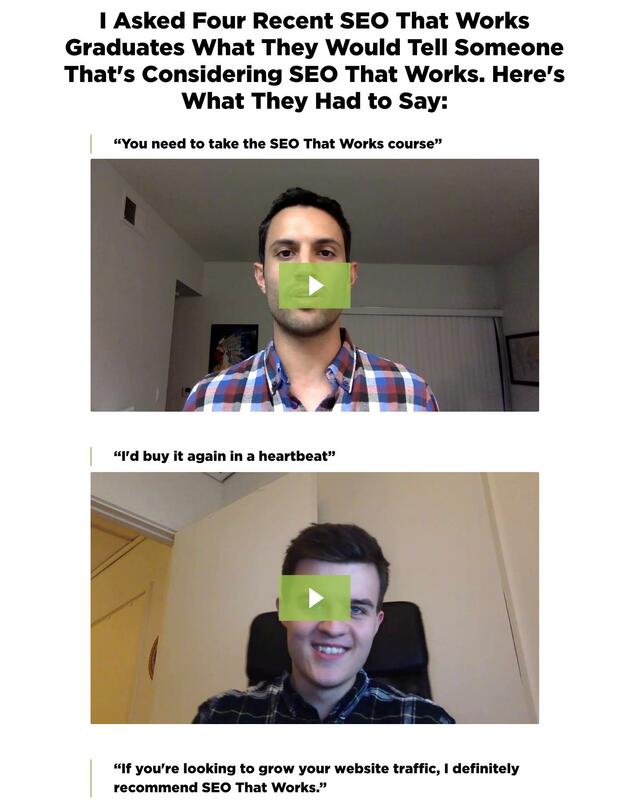 Brian Dean’s latest course – SEO That Works, includes a wide variety of client testimonials either in text or video format. And he hasn’t cluttered up one section of his landing page with a large number of testimonials. No, instead he has bunched up 2-3 testimonials (few text ones with a video testimonial) and used them wherever it is relevant to the visitor. This works because instead of the visitor having to read through a detailed FAQ section, they can now simply read or view a testimonial and clear their doubts right away. Brian still has an FAQ section at the end though. But as we’ve come to expect, he has been quite clever about this as well. Instead of just having a traditional & dull Question-Answer format, he’s mixed things up nicely with excellent copy & video testimonials as answers to any query his audience might have. It’s insane how much value he has put on display in his website currently. It’s not an overload of information, but rather an excellently delivered course on a platter for his visitors & target audiences. Social proof is equally important to improving your credibility & building trust in your audience. Anything from likes, shares, subscribers, pins, tweets etc. is social proof of your company & its popularity. Display these prominently on your landing page. The benefits describe the problem you are solving, and the features describe what it does. Do not consider it as an additional explanatory chunk of text for you to fit after the Hero Section. The ultimate goal is to make your customer feel like your product or service is the thing that will positively change their lives. 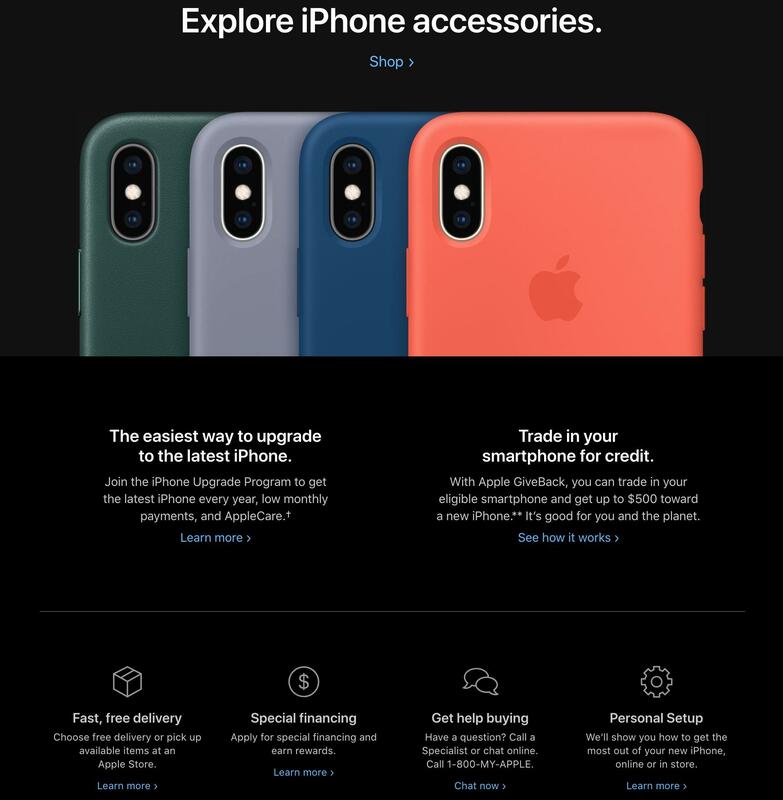 Apple always showcases their new products in such style and vivid detail that you are captivated completely from the moment you land on the page. They have smart animations, the precise amount of text regarding each feature & model, and then right at the end of the page (as you see below), they list these seemingly basic yet compelling benefits. By the time a user scrolls down to this part, they are already sold. That’s the level of attention-grabbing & fascination you want to achieve with your product or service. SweatBlock’s website is also amazing. They have a clean website design throughout. And in the right places, they have displayed such relatable and real-world benefits & product fascinations. They deliver a promise of sweat-free 7 days & clearly describe situations where SweatBlock customers can excel in their day to day life. It’s brilliantly simple, yet highly effective. And truly, your customers, or any customer for that matter, love guarantees. The word on its own improves the likelihood of a conversion. Guarantees can take many forms. Choose a type of guarantee that works for your business type, and state this guarantee on your landing page. Position your guarantee statement close to the CTA. This proximity will help the user receive a final bit of assurance, and be ready to convert. As you write your guarantee, you don’t necessarily need to delve into the legalities of it. Just say it. The point is that you have a guarantee, and the customer knows it. This money-back guarantee is extremely compelling for users who are on the fence about investing in the course. Although it doesn’t necessarily give an explicit guarantee, they do provide a level of comfort that’s similar to a guarantee. The award and shield icons are also reminiscent of trust badges, further enhancing this assurance. 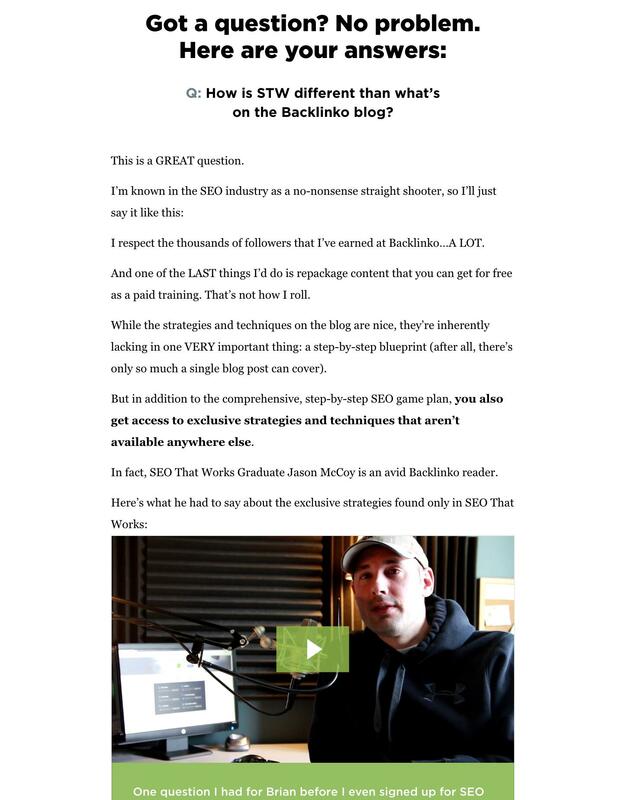 Brian Dean mentions a 30-day guarantee for his course – SEO That Works. 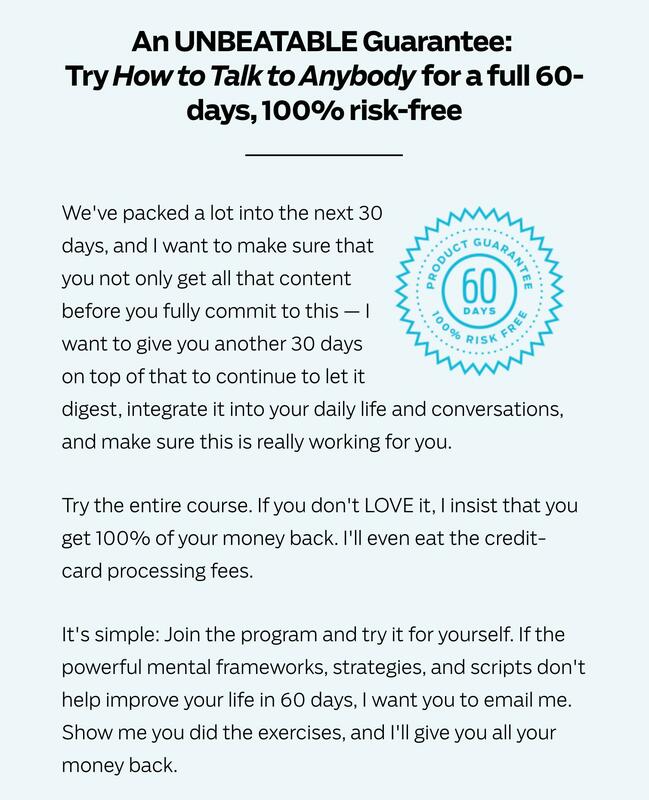 The fact that he’s added a “No-Questions-Asked” phrase to his Money Back guarantee makes the course he is selling even more compelling for interested visitors. Anyone in doubt prior to purchasing this course would now readily invest in it because of such an explicit guarantee. The Call to Action button is the most essential element of your landing page. This is the element that the rest of the content on the page is designed to drive visitors’ attention to. It’s what ultimately converts visitors into coaching clients. Your button should be the first thing your visitor’s eye is drawn to on your landing page. You want it to be what people notice when they initially land on your page. Not your image, not your headline, and not your subheading. Your button. That means not making your button blend in. It shouldn’t be part of the upholstery. It needs to pop. And you can make your button pop off the page and grab the visitor’s attention by using an action color. It’s the first thing your eye is drawn to on the page (even if you didn’t realize it!). You’ll also notice that contrary to what Sumo tells us about using a contrasting color on the button itself, Mixpanel designers chose to use a contrasting color for the entire CTA section. And positioning is an essential consideration for the CTAs on each of your landing pages. It can make or break whether users click them. SweatBlock also has this amazingly high-contrast CTA button. By being this contrasting green, it stands out from the grays, and blacks of its surroundings. 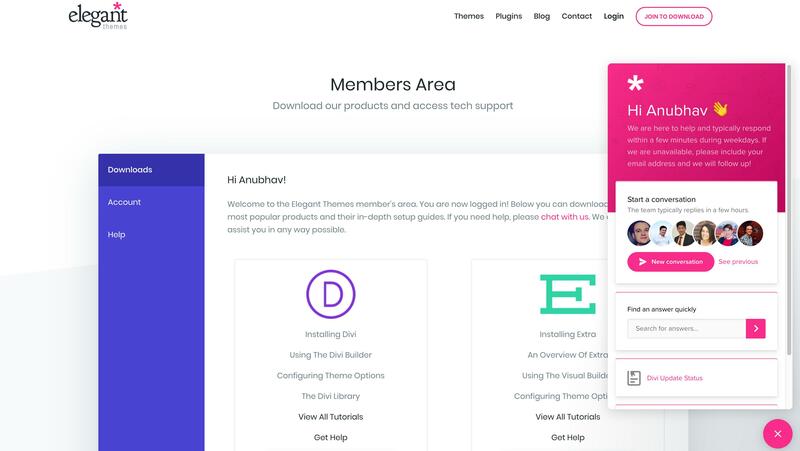 ElegantTheme’s CTA uses pink instead of the green but achieves the same effect of showing the contrast & drawing the visitor’s attention to the CTA. With these above examples and all the necessities that involve the CTA button, this following checklist by HubSpot should help you to create your landing page’s CTA button. DON’T use “submit” on your form buttons. DON’T hide your CTAs where no one can see them. DON’T use the same or similar colors in your CTAs as the page’s background color. DON’T use teeny, tiny CTAs that no one will notice. DON’T make the design of your CTAs look flat. DON’T use CTAs in the wrong place at the wrong time. DON’T use vague, cliché, or passive language. DON’T link your CTAs to your homepage. DON’T use too many CTAs on one page. DON’T forget to build trust through design and copy. DON’T miss opportunities to promote your CTAs. DON’T use the same CTAs for too long. DON’T forgot to search engine optimize your CTAs. DON’T use Flash or complicated animations. DON’T use branding as the only objective of your CTA. DON’T use the same CTA for everyone. DON’T cram your CTAs into little spaces. DON’T obsess over a pixel-perfect design. As you develop your CTAs, look for ways to provide immediate value to your visitors. The sooner they can start seeing the benefits of taking action, the more compelled they’ll be to do just that. Creating effective CTA buttons doesn’t need to be a complex process. In many cases, the most obvious, logical option is the most effective. As long as you keep your users in mind and aim to make it as easy as possible for them to do what you want them to do, you’re on the right track. They are buttons. Save your creativity for other parts of your website, like the copy surrounding your CTAs. Combine these verbs with power words mentioned previously to generate some solid phrases that increase conversions manifold. Eg – Only X days left, Limited supply, Closing soon, While supplies last, Today only, Last chance, Offer ends on “date”, Hurry, Immediately. They have a logical placement. Eyes move in paths, not jumps. Put your CTAs where they’ll be seen. They use a contrasting color. Don’t spend too much time testing different shades, but make sure that your button stands out from the other elements on the page. They have a close proximity to the previous action. The mind and the pointer have a symbiotic relationship. Your CTA becomes part of that as it moves directly into the cognitive and visual flow of the user. They aren’t forced to compete. Don’t lose conversions by crowding out your CTA with other, less-important actions. Your CTAs should be the clear focus of your landing pages. When you’re writing button copy, keep it simple and specific. You want the reader to know exactly what to do at a moment’s glance. Focus on just one message and communicate it simply and clearly. And don’t try to be clever! There should be no question about what you mean. Do all the work for the reader so they know exactly what they’ll get when they click the button. As a coach, you are definitely running a legit business. So make perfectly clear on your landing page. Provide multiple contact methods such as your phone number, a physical address, email address and even include a contact form if it is necessary. You could even use easy-to-setup chatbot plugins like Drift, that popup whenever visitors are on your coaching website and provide further help & information as & where required. At the most basic level, provide some assurance that you are a real company. Usually, this involves a physical address and a phone number. Live chats featured in a popup can be helpful, but not a must-have. Using live chat is somewhat controversial. If you insist on using one, do your homework, and make sure you have some convincing reasons for keeping it there. The main idea behind providing such multiple methods of contact is to show that you are present & responsive to your client’s needs & queries. ElegantTheme’s support is quite brilliant and quick. Their forums are also pretty detailed & the chat service is very helpful. 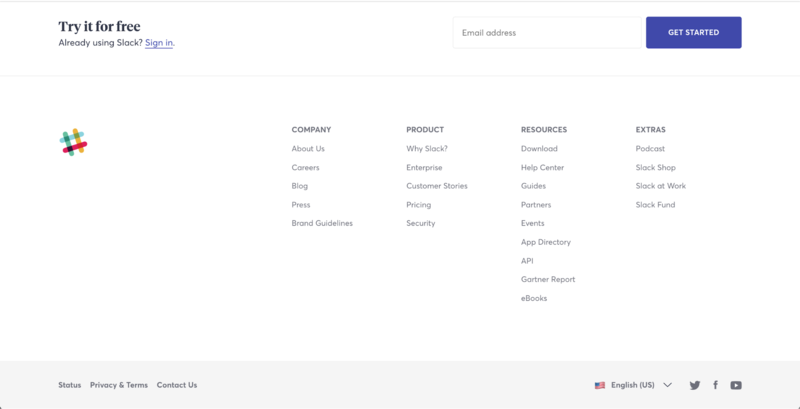 Slack’s footer is pretty simple but has all the important links that a visitor might need. Such optimised footers are what you should try an implement for your business. BONUS – Check out Hello Bar. It is a very handy tool that you can implement on your landing page. As you can see below the Hello Bar appears above the main navigation. Here you can have a quick sign-up form or you could announce some sale or discount or even provide a freebie. This way you keep your website visitors intrigued and convert more into your coaching clients. You can use exit popups for your coaching website. It doesn’t disturb the flow and it only appears when your visitor is about to leave your site. They help you build an email list for your business which is probably the most important thing in any online coaching business. Learn more about them here. I hope you received some value from this article. I can understand there is so much you are doing as a coach or consultant. It must be really difficult to take care of everything – meeting new prospects, understanding their needs, creating content for growing your business, maintaining your website and social media presence. Best of Luck for your coaching journey! And, we will give you a live website review.